Mystic Seaport Museum Members enjoy exclusive day trips and overnights to areas of interest around the Northeast, including Newport, RI, Block Island, New Bedford, MA, the Berkshires, and more! 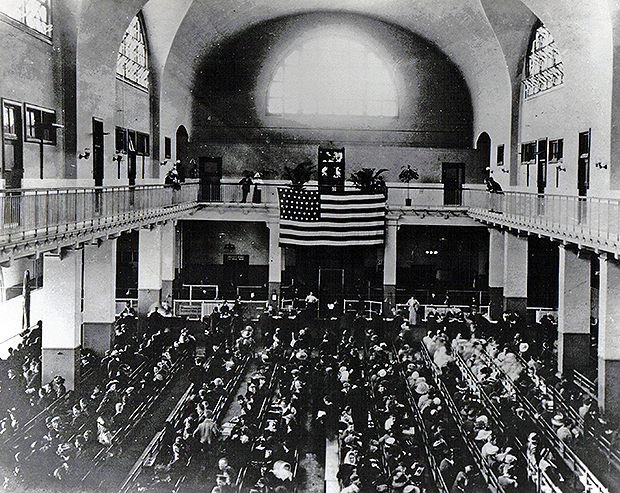 Ellis Island, now a 27.5-acre site located just minutes off the southern tip of Manhattan Island, New York, is one of the most popular tourist destinations in the National Park Service. During the immigration years from 1892-1924, more than 12 million immigrants entered America through the “golden door” of Ellis Island. Whether passengers or crew, first class or steerage, the voyage was an unforgettable experience. Throughout the exhibit, visitors can view photographs, video, and artifacts that depict these stories of immigration. It has been estimated that nearly half of all Americans today can trace their family history to at least one person who passed through the Port of New York at Ellis Island. The Statue of Liberty exhibit located on Liberty Island opened in July 1986. This exhibit traces the history and symbolism of the Statue of Liberty through museum objects, photographs, prints, videos and oral histories. In addition to historical artifacts and descriptive text, full scale replicas of the Statue’s face and foot are also on display. Our day will begin early at Mystic Seaport Museum as we board our bus to New York City’s Battery Park. We’ll then travel by ferry to Liberty Island and Ellis Island to visit both sites. Dining areas can be found on both islands which feature burgers, sandwiches, salads and snacks available to purchase. Participants are welcome to bring their own lunches to enjoy on either island as well. Following our afternoon on the islands, we’ll have time in the city at Brookfield Place for dining, shopping, and site-seeing* before boarding the bus back to Mystic Seaport Museum. *Brookfield Place is located near the 9/11 Memorial and Museum. The 9/11 Memorial is open to the public free of charge. The 9/11 Museum requires admission. For an additional $22, members can select to visit the 9/11 Museum from 4:30 to 6 p.m.
Space is limited. Please register by calling the Central Reservations office at 860.572.5331 by Wednesday, April 20. Cancellations made up to 30 days prior to the start of a program will receive a refund less an administrative fee of 25% of the registration cost. No refund will be given if canceled within 30 days of the program. If Mystic Seaport Museum should cancel the program for any reason, all participants will be notified as soon as possible and receive a full refund.